We are often asked how to feed deer and or how to set up feeders successfully. from the old way of feeding deer and we want you to do it right, safely and successfully. a good overview on enjoying this wonderful hobby. 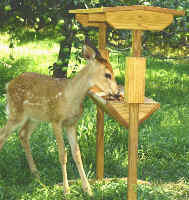 When finished reading, view our high quality deer feeders and set up your own feeding station today. We handcraft the one and only, Hurley-Byrd Deer Feeder. It is one of our more popular feeders and for good reason. The fun and joy of watching deer is like no other. To have these beautiful creatures grace your home regularly adds a whole new dimension to your wildlife feeding sanctuary and doing so with a Hurley-Byrd Deer Feeder could not be easier. I wish to spotlight The White-tailed Deer and offer some feeding tips to get you started. Keep in mind, all deer use Hurley-Byrd feeders. This article will also address Black-tailed Deer and even Moose and Elk to a degree. The feeding activities of all deer are very similar. probably noticed they are always on guard. I call it their “Twitchy Nature” and I mean it. trouble, they are gone like a lightning bolt. more than happy to stay around as long as there’s a fairly consistent supply. animal, call your local wildlife control organization and do not approach the animal. Any wounded animal is potentially very dangerous. your feeders away from any area where people may come into close contact. types and may contain animal remnant by-products from slaughterhouses or the like. deer chows unless you are positive they are tested safe. WILL NOT eat it. You have now wasted money on an expensive product and it must be discarded. in hopes of feeding their turkeys or other large birds such as Crows, Blue Jays and Cardinals. population of them, they will readily feed from your deer feeder. The MOST important rule of feeding deer is to offer one type of feed consistently. feeding their deer when the weather gets very cold or after other food sources are gone. feeding, keep the same base food type available throughout the year or season. like all cows, can positively digest corn as long as you follow the information noted above. of the whole year and I guarantee it will become one of yours too. Pick out a new deer feeder today and add a whole new dimension of wildlife feeding to your yard. will help you feed them correctly now and for years to come.